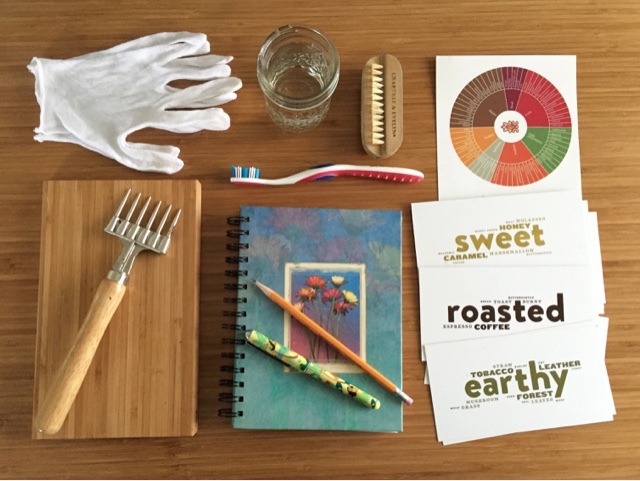 Tools for chocolate tasting and palate training. Now you're going to know exactly how far down the rabbit hole I've gone with chocolate tasting. Essential tools for tasting chocolate. I taste chocolate daily, sometimes as a part of research, experiments and palate training. Other times as a purely pleasurable experience. These are the tools I use, I keep them on my desk or nearby, some I even carry with me on most days. Nail brush. Before I start tasting I'll wash my hands and nails with fragrance free soap then I'll scrub them with this brush to make sure all soap residue has been removed. I don't want any transfer onto the chocolate or even on my hands when I'm smelling the chocolate. I also make sure I don't use any perfume or other scented products. Cotton gloves. Wearing latex gloves while handling chocolate (as in breaking up bars by hand) can leave a lingering scent of latex on chocolate. That scent eventually goes into your mouth where it becomes a flavor. This doesn't enhance the experience, believe me, I've tasted latex at a very prestigious event. The only gloves that touch my chocolate are cotton. Cutting board. When I taste chocolate I want to taste only chocolate. There needs to be one cutting board that is dedicated only to chocolate. Nothing else. No onions or garlic, no meat, no cheese, nothing but chocolate. Chocolate can absorb other scents very quickly so you don't want to put your twenty five dollar bar of chocolate down on top of lingering onion scent. I'm even a bit picky about the chocolate that I put on this board. If the inclusions are possibly too strong (scorpion pepper, mint, get creative here), those bars won't touch this board. Chocolate fork. Great for breaking chocolate. Made for big thick chunks of chocolate however it works great on thin bars too. The one thing you need to know, it will leave a straight row of little dents on your wood cutting board, or on your table if you happen to be using a flimsy plastic cutting board. Warm water. Palate cleansing is a must when tasting and palate training. I prefer warm water at 140 degrees to cleanse before tasting and between samples. Toothbrush. It may seem a bit disgusting to talk about little bits of food that can get stuck in and around your teeth. It happens, especially when tasting chocolate with sticky inclusions or when palate training with foods other than chocolate (just about any dried fruit). I keep a clean toothbrush that has never seen toothpaste on my desk. I never use toothpaste during a tasting or training however a toothbrush and warm water will make sure that any little bits that could cloud judgement or perception will be removed quickly. A journal. Tasting or palate training without a way to record your perceptions or experiments is just eating chocolate. If you truly want to train your palate, or even just remember the chocolate bars you've tasted and recall the impressions, you'll need to take notes. You can take them however you like, on a computer, on your phone, or in a journal. I find that the journal is easiest for me to jot down notes without being distracted by incoming email or notifications. Later I copy the notes into a digital format. A pen. You'll need a pen without scented ink or a pencil. Make sure that whatever you use to write with doesn't leave a scent on your hand or on your paper. Stray scents will interfere with what you smell and taste in chocolate. Tasting wheel and flash cards. I keep them handy but out of sight when first tasting so that the power of suggestion isn't too easy to consider. I use the chocolate wheel from Chocolopolis and flash cards from The Chocolate Tasting Kit. Call me crazy or a fanatic, either way I don't really worry, I'm happy tasting, evaluating, palate training and consuming craft chocolate every day. Woo Hoo! Comments are working again! Great post! I would like to add some information about https://www.idealsvdr.com/virtual-data-room/ . This is also a very interesting topic for you.